Natural hair is so versatile. What’s great is with all the protective styles available to you, there’s no reason you can’t come up with a new style every week! I thoroughly enjoy discovering new ways to style my hair. Protective styling your hair is also protective for your skin. The less your hair is hanging in your face, on your shoulders or on your neck, the less of a chance you have for germs to be introduced onto your skin. That means a reduced chance of getting a pimple. Score. I achieved this minimal protective style with 3 simple accessories: The Banana Clip (remember when these came in colors? 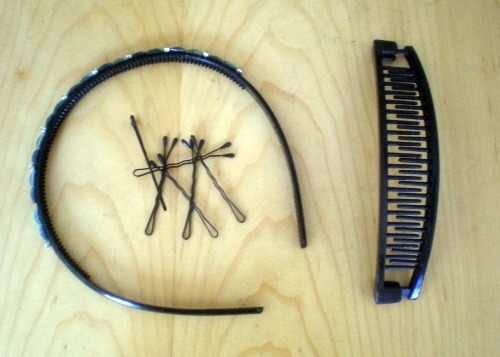 ), Goodie Ouchless Bobby Pins and a cheapie headband I forgot I had. What’s great about the banana clip is you can achieve a much fuller bun with it. Of course, you have to have enough length to wrap it around but as long as you can get half of the hair around once in one direction and the other half around in the other direction, all you have to do is pin and you’re good. Have you or do you ever use the banana clip in any of your hairstyles? P.S. I nearly forgot about my old friend, the banana clip until few months ago when I saw a video of it’s use done by Kimmaytube on YouTube. Then, my friend Shelli of Hairscapades did a video tutorial. I will be buying a banana clip and experiment with it. Thanks Michelle for sharing! You’re welcome Seleema. I think you’ll love this throwback LOL. It’s very versatile and causes little to no hair breakage, unlike elastic bands.